Cleopatra - The favourite pharaohs of many high rollers! Cleopatra has inspired several game developers from Novomatic to PlayNGo, and Betsoft. It is no secret that Egyptian themed video slots online have always been a crowd pleaser with casino players. Perhaps because they are mythical and tapped into the explorer sense of each player. But the Egyptian theme that tops all chart when it comes to the most number of unique players enjoying it is certainly Cleopatra by IGT. Since it was launched in the land based casino it has been one of the most played game in Las Vegas. Keen to capitalised on its land-based success High5games (the online version of IGT) has released a web version of this mega-hit video slot. This means that players who have enjoyed playing Cleopatra in brick and mortar casino can now enjoy it online too. 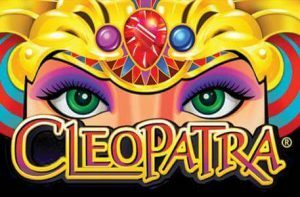 Cleopatra is a 20 flexible payline classic video slot. The minimum coin you can bet pet line is 1p and the maximum coin is £50 which makes to a max bet of £1000 per spin. The game has 5-reels and 3-rows. Like most land-based adaptation, the RTP (return to player) is quite low at 95.02%. The maximum coin win you can experience on this video slot is 200,000 coins. Cleopatra is a massive hit game with British players, the forums and social media are filled with big winner stories. It is true that this classic video slot is highly volatile. So, it is better suited to experienced online casino players who like classic video slots. Knowing this should not stop new casino players to have a few spins on this notorious game. Because the paylines are flexible Cleopatra is an awesome game to finish a casino session on as it will allow spend your complete bankroll and leave no penny behind if it’s what you are after. Cleopatra has 6 feature symbols and the royal suite of A, K, Q, J, 10 and 9 is also present on the reel. Cleopatra is the Wild symbol. In the based game, it’s interesting to know that if you manage to hit a Cleopatra on a payline, your winnings will instantly be doubled. A Scarab and the hand fan are the second best-paying symbol and pay at equal value. Aligning 5 of these symbols on the reel will give you a coin win of 750. The Cartouche (gold plate) is the third best-paying game symbol and 5 will award you 400 coins. You’ll also notice two hieroglyph symbols which pay at an equal value in this game and 4 will give you an instant coin win of 250. There’s only one bonus feature in Cleopatra which is the free spins mode. This mini-game is triggered when 3 Scatter symbols land on the reel and will award you 15 free spins. Additional free spins can be earned when three more Scatters land on the reel. Unlike other games, the maximum numbers of free spins awarded in the bonus are capped at 180. During the free spins game, all wins will be tripled except if you get 5 Cleopatra symbols. You should not be discouraging by the fact that the maximum numbers of free round the game can award you is capped. Frankly, you’d have to be very lucky to consecutively trigger 12 free rounds and at this stage, the game would have already handsomely rewarded you. Playing this game could award you any of the 3-progressive life-changing jackpots. The jackpot of Mega Moolah isis is also linked to the Mega Moolah one. Delivers a great deal of action in the bonus feature because if you reach the top, you could bag yourself 5 Stacked Wilds. This game is filled with features like stacked symbols, a gamble feature, and free spins. The maximum coin win of 2,500,000 is also very attractive to players. Land based adaptation games are great for players who have enjoyed playing them in brick and mortar casino. They allow players to bet much higher than games developed strictly for the online market. But they are better suited for experienced played and high rollers because the house edge is higher by 2% than the average house edge of the web-based video slot. You will need a healthy bankroll to unlock the free rounds.